This is the third annual Peace Mala International Awards for Youth and the number and standard of entries has grown each year. This is a wonderful sign of the way the Peace Mala concept is maturing and reaching evermore committed and imaginative children and their outstanding teachers. There was an abundance of entries this year, and it was a truly pleasing challenge for the judges to make their choice of winners. Every school or group which has entered is already a success, because today's children are being well prepared to be tomorrow's citizens, with attitudes of caring for the human family, animals and the environment on spaceship Earth. 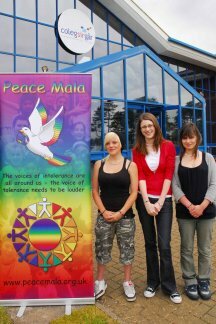 Pam Evans, Founder of the Peace Mala, and her team, made an increased number of visits to schools and youth groups and introduced Peace Mala through Assemblies and Workshops. 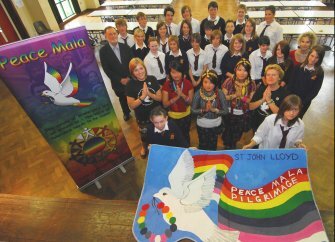 There was always an enthusiastic reception, as the truth and aspiration of Peace Mala is instantly recognised by young people, with its message of non-discrimination, non-bullying, and positive harmonious celebration of diversity. 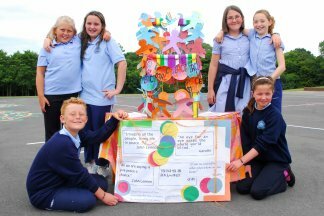 Several very positive schools - Hafod Primary School, Swansea, Clase Primary, Swansea and Pont-yr-Gof, near Pontypridd - had exciting projects under way, but ran out of time, and intend to re-enter next year. In particular, the work done at Hafod Primary School in Swansea, led by inspirational Head Teacher Rachael Webb, has been impressive and integrates the UN rights of the child, and the Salamanca statement on inclusion with a committed adoption of the Peace Mala project. The school has already received the Golden award. 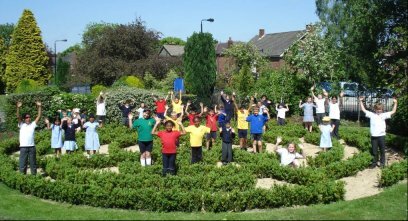 A start has been made by parents and children on the design and construction of a global faith garden, as well as achieving many colourful and enthusiastic expressions of diversity throughout the school. Hafod Primary School would be in a strong position to receive the Peace Mala award on re-entry next year, and we are happy to give a Highly Commended Certificate this year. 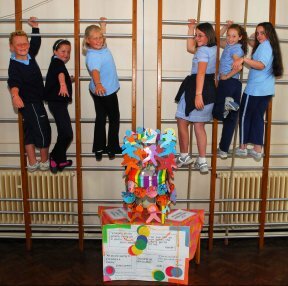 Rhyd-y-Gors Primary Support Service Carmarthenshire, for children with behavioural difficulties, entered a splendidly colourful display with hands of the world's children and flowers in three dimensions. It was particularly moving to see how these children who have already experienced difficulty in their lives could reach out and empathise with all other children. This entry received a Highly Commended Certificate. Brynamman Primary School, whose highly poetic Welsh medium dance, song and percussion interpretation of the unity of life splintering into faction and disharmony then being healed into unity again, was extraordinary. Hopefully, these gifted children will perform their work for us at this year's awards ceremony in the WCIA Temple of Peace in Cardiff in September. Their entry is Highly Commended. Woodheys Primary School in Sale, Cheshire, has already received the Ashden Award for energy conservation which was presented by Al Gore. Their Peace Mala entry recording the whole school project led by Head Teacher Laura Daniels is breathtaking. The school has adopted St Francis as the Patron Saint of the Environment, and there are solar panels which produce electricity, while the children monitor how much energy is used and saved. There is a green plant Labyrinth, which leads to a Prayer Tree, and the project culminated in a Rainbow Day celebration of Diversity. 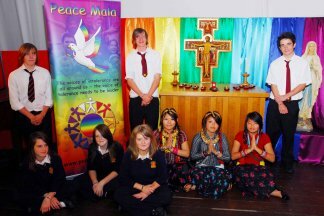 The ethic of Peace Mala is lived entirely throughout the school, which is a shining example of joyful living without harm. We are delighted to give this exemplary school The Junior Peace Mala Award. Crynallt Primary School in Cimla, Neath, for sheer exuberance of involvement was also an outstanding entry. 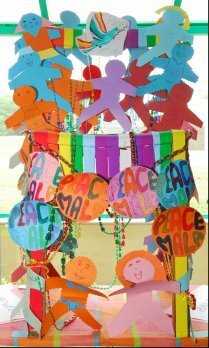 This was a whole school activity, led by gifted Teacher Susan Spacey, and shows powerfully how the idea of Peace Mala can generate enthusiasm and activity on an extensive scale, starting from scratch and reaching everyone. The children's individual entries and observations reflected the whole range of ability and age, in colourful and creative display. It was clear that tremendous excitement had been generated throughout the school. We were particularly impressed with the Peace Mala Chair (pictured here) and are glad to give Crynallt School the second Junior Peace Mala Award. Rhyd-y-Gors Secondary Support Service Carmarthenshire put in an eye-catching group entry, showing a mature understanding of the concept of fellowship, and interpreting the word 'Mala' in its original Sanscrit sense of flower garland, worn around the wrists of the youth of the world. We are happy to give a Highly Commended Certificate to this entry. Coleg Sir Gar, Pwll Campus, made a distinguished entry from their A level Art students. Pam Evans had made a presentation to the older students, which had a huge impact. Several had experienced bullying earlier in school. Emily Jones made a bold, imaginative, black and white and rainbow visual statement, whose import was that we should not see the world in sharp black and white but in subtle shades of grey. Laura Jones took inspiration from the actual Peace Mala bracelet, and made a most accomplished design embodying interlocking circles of inclusion, and the large vision of stars and light at a cosmic level. Dannie Clifton presented an intriguing and multi-layered image of the earth as seen from space, supported by a 'white' and a 'black' hand. The viewer is invited to decipher scattered text, the effort required to do so embodying the effort needed to confront the 'insecurities within' without which the growth of the individual cannot proceed. As a personal and universal journey of exploration this was outstanding. We are pleased to give these students the Peace Mala Senior Award. Finally, 37 students and their staff from St John Lloyd Catholic Comprehensive School, Llanelli went on a Peace Mala Pilgrimage for World Peace at Easter to Rome, Florence and Assisi. They took with them a glorious hand painted banner, a specially compiled Peace Mala anthology of Prayers for Peace from world traditions represented on the Peace Mala bracelet, plus votive candles and holders all specially designed by the students. At each of the many sacred sites which they visited, the students lit a candle which would burn for 7 hours, after reciting three of the prayers from the anthology. By fortunate coincidence, they met a pilgrim who was going to Jerusalem, and who took one of their Peace Mala votive candles to the tomb of Christ in the Church of the Holy Sepulchre. At Assisi they celebrated the start of the Interfaith Movement in 1987 by Pope John Paul II, together with other world spiritual leaders, including the Dalai Lama. The preparations and the pilgrimage itself are recorded with excellent photography on a CD power-point presentation which will be shown at this year's awards ceremony. This outstanding achievement, which was also a whole journey of discovery for the students, receives the second Peace Mala Senior Award. The brief descriptions given here will, we hope, give some of the flavour of the diverse, deep and lively accomplishments that we are here to celebrate, as we go forward to create a future where there will be no prejudice, only friendship and understanding. Cheryl Sullivan, Martin Harvey, Norma Glass, Shereen Williams, Ros Moule, Pam El Hosaini and Elaine A Thomas. Peace Mala is extremely grateful to all those who have sponsored and supported the 2008 Youth Awards.